Reebok is one of the world’s leading fitness brands. Have you ever wondered what it is like to work there? I spoke with Andi Archer, a product manager at Reebok, about her career journey at the brand’s headquarters in Canton, Massachusetts. Bruce Harpham: What did you study in college? Andi Archer: I studied design at the Rhode Island School of Design and started at Reebok shortly after graduating with a MFA in apparel design in 2009. BH: Who are some of your favorite designers? AA: In my work, I take inspiration from street wear – what people are wearing every day. I also follow a few designers with interest. Alexander Wang, Dion Lee, Cynthia Rowley, and Thom Browne are some of the fashion designers I follow. BH: What strategies help you to stay productive and engaged in your work? AA: My outside activities in coaching and athletics inform my outlook and keep me connected. In addition, I aim to focus on one activity at a time. Otherwise, it’s easy to become overwhelmed. BH: What’s the best career advice you ever received? AA: Adopt the flexibility attitude when you go through transitions. There was a lot to learn when I moved from a designer job to a product manager job at Reebok. I had to adjust my mindset and professional identity after working in design for a number of years. BH: How did you land your first job at Reebok? AA: I had talked with a recruiter who introduced me to the right person. I was fortunate to join Reebok’s apprentice program. This program aligned well with my college interests, where I had an interest in fitness and active wear. The apprenticeship is a one-year program for post-grads that gives you real life experience and eases graduates into the workforce. The goal is to train them up and hire them after the one-year apprenticeship. I believe there were about 15 of us across design in apparel, graphics, and footwear. BH: How did you land your role as a product manager? AA: In December 2015, I accepted the product manager role. The managers I’ve worked with at Reebok have been highly supportive of career development. I was able to explore different departments and learn about them. Prior to starting the role, I had some exposure to product team as a designer, and that helped me through the transition. 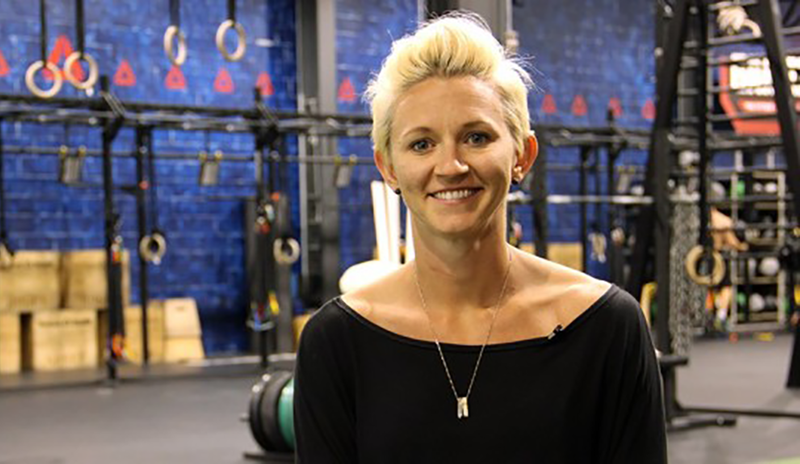 BH: What’s it like working on Reebok’s CrossFit products? AA: It’s exciting! I’m a fan of CrossFit, so this is a great set of products to work on. I also appreciate the fact that Reebok’s commitment to CrossFit runs deep. At our Canton offices, there’s a Reebok CrossFit club that has hundreds of members. Many people regularly go for a workout during the lunch hour and other times during the day. I plan product launches and seasonal strategy and direction for our line, and I work with design and development to drive innovation. We are responsible for briefing our design team on product strategy and direction. We also brief our brand communications team, which is responsible for producing the marketing materials for the markets. We do factory travel, trend-research trips, and trade show visits. We meet a lot with athletes and attend larger events like the CrossFit Games, regionals, and open workouts. We also meet with our global markets and set up and execute high-end retail showrooms. Outside of work, I’m active as an athlete and coach in CrossFit, so it’s an area that I’m constantly thinking about. BH: Walk us through what a typical workday looks like for you. AA: I usually arrive around 8:30 AM and go for a workout during the noon class or the 5:30 PM CrossFit class. I tend to wrap up and head home by about 6 PM. I work very closely with design and development in the early stages of the season. As the season progresses, we work with our markets (globally) and brand communications team. In terms of software, I mainly used Illustrator when I was in design. Today, I use PowerPoint, Excel, and various internal databases. I also test out new CrossFit products as they are produced. One of the key things we say in CrossFit is that it is designed for CrossFitters by CrossFitters. Sometimes, you need to know for yourself how something feels or works. It’s great we can be so close to our products and really use them ourselves. - and being part of the fitness community. Because our brand is driven and focused on this it is vital for us to be a part of it! Yoga, CrossFit, running, boxing, spin, dance – whatever it may be! BH: How have you grown your career through stretch assignments? AA: In 2015, I pitched an idea to do something special for female athletes competing at the CrossFit Games in Carson, California. I thought it would be a great idea to produce a custom makeup kit for the athletes so they would have them available to look and feel great around the event. After I pitched the idea, it took a few months to organize. Fortunately, I was able to work with FACE, a Swedish cosmetics company, to put the project together. This project helped my career growth because it involved creativity, working with new organizations, and having an impact on athletes. This project benefited about 300 women athletes at the event. BH: What is something that surprised you about Reebok after you started working there? AA: It was great to learn about the pro-fitness culture. Most people are highly interested in athletics and fitness. There are fitness facilities at the office, and people actually use them! BH: What is your favorite travel destination? The Cayman Islands. While I’m there, I like to go for scuba diving, snorkeling, reading on the beach, and always hitting up a CrossFit workout at CrossFit Seven Mile! BH: What is your favorite book? AA: The Alchemist by Paulo Coelho. The book makes me want to pursue more and better myself. I found it to be an entrancing and liberating book. BH: What Olympic sport did you follow most closely? AA: I was interested in weightlifting because I recently got involved with it. BH: What career tips do you have for other designers? AA: As you work on a product, I recommend focusing on one area at a time. For example, focus on design and then turn to the launch stage later. BH: How can readers get in touch with you on social media? AA: Readers can connect with me on Instagram. Bruce Harpham is a writer and the founder of ProjectManagementHacks.com. Bruce Harpham is a writer and the founder of ProjectManagementHacks.com, a career advice website. He has been featured in Monster.com, the Globe & Mail newspaper, College Recruiter, ProjectManagement.com, Infoworld, CIO, and other publications. Outside of work, Bruce enjoys wine, science fiction books, and world travel. Bruce lives in Toronto, Canada.